Women’s winner Worknesh Degefa hits the tape. 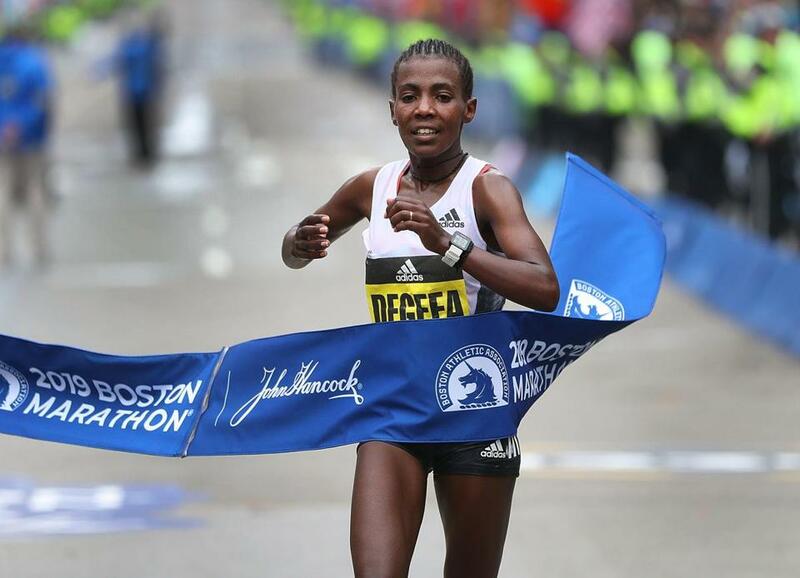 Worknesh Degefa was fast and fearless. The 28-year-old Ethiopian came to Monday’s Boston Marathon with the fastest time in the women’s field, a 2:17:41 she ran in Dubai in January, a time that was also the fifth fastest in women’s marathon history. Turns out, running an Ethiopian national record apparently didn’t tire her out. Just three months later, she was here in Boston, whipping the field as she crossed in the line in 2:23:31, 42 seconds ahead of three-time Abbott World Marathon Majors series winner and 2017 champion Edna Kiplagat of Kenya and 1:49 ahead of third-place American Jordan Hasay (2:25:20). It was Degefa’s first World Marathon Major victory. Degefa made her move early. As the race crossed from Ashland into Framingham, about five miles from the start, Degefa strode away from the lead pack of some 20 runners — running a 5:12 split, her fastest mile of the race — and kept on striding. She never stopped until she got to Boston. Degefa ran alone from Framingham to Boston, looking back briefly in Natick and seeing only air and shadows. The lead pack was thick with runners coming out of Hopkinton, as many as 30 knotted together with American Sara Hall at the front. But it wasn’t long before Degefa started to move ahead, first by a step or two, then a step or two more. Sharon Cherop and Mare Dibaba stuck with Degefa for a mile or two, but once Degefa hit the flats of Framingham, it was a one-woman show. By Mile 7, she had a 20-second lead and she continued to stretch that lead as she picked off the towns along the famous 26.2-mile route one by one. In Natick, her competitors were no longer visible on the road behind her. The other runners let her go. She didn’t. Her lead reached nearly three minutes at Mile 18 by the firehouse turn in Newton. And those Newton hills? Not an issue. She charged up one after another with the same steady pace, boosting her mile splits by about 20 seconds on the uphill but never wavering. Degefa is a relative newcomer to the marathon, having run only three previous marathons, all on the flat course in Dubai. But she dusted off Boston’s infamous hills the same way she dusted the competition. Kiplagat led the chase pack, which included Hasay and Linden. The group made a lot of tactical moves and Linden felt moved to give her American compatriot some advice. Kiplagat tried to mount a charge at around 15 miles and she might have had success because Degefa finally slowed on the hills. Degefa, too, felt the 35K mark was pivotal.